Due to the large-scale global transformations of the 20th century, migration literature has become a vibrant genre over the last decades. In these novels, issues of transcultural identity and belonging naturally feature prominently. This study takes a closer look at the ways in which the idea of family informs processes of identity construction. It explores changing roles and meanings of the diasporic family as well as intergenerational family relations in a migration setting in order to identify the specific challenges, problems, and possibilities that arise in this context. This book builds on insights from different fields of family research (e.g. sociology, psychology, communication studies, memory studies) to provide a conceptual framework for the investigation of synchronic and diachronic family constellations and connections. The approach developed in this study not only sheds new light on contemporary British migration literature but can also prove fruitful for analyses of families in literature more generally. By highlighting the relevance and multifaceted nature of doing family, this study also offers new perspectives for transcultural memory studies. The world wars, genocides and extremist ideologies of the 20th century are remembered very differently across Central, Eastern and Southeastern Europe, resulting sometimes in fierce memory disputes. This book investigates the complexity and contention of the layers of memory of the troubled 20th century in the region. Written by an international group of scholars from a diversity of disciplines, the chapters approach memory disputes in methodologically innovative ways, studying representations and negotiations of disputed pasts in different media, including monuments, museum exhibitions, individual and political discourse and electronic social media. Analyzing memory disputes in various local, national and transnational contexts, the chapters demonstrate the political power and social impact of painful and disputed memories. The book brings new insights into current memory disputes in Central, Eastern and Southeastern Europe. It contributes to the understanding of processes of memory transmission and negotiation across borders and cultures in Europe, emphasizing the interconnectedness of memory with emotions, mediation and politics. The impact of digital global media, geopolitical changes and migration demands new theorizations within memory studies. Despite the growing field of media memory studies, the impact from film and media studies has been scarce within memory studies. This unique study offers new theorizations of three crucial concepts for media memory studies: remediation, transculturality and the archive. This book takes a closer look at the media specificity of archival footage and how it is adapted, translated and appropriated. In its original approach this work reflects upon the role of documentary film images for the construction of memory. By merging film and media studies with memory studies the work offers multiple theoretical and methodological approaches for everyone interested in the heritage of audiovisual media: film and media scholars, memory scholars, historians, art historians, social scientists, librarians or archivists, curators and festival programmers alike. Memory in the Balkans has often been described as binding, authoritative, and non-negotiable, functioning as a banner of war. This book challenges such a one-dimensional representation and offers a more nuanced analysis that accommodates frequently ignored instances of transnational solidarity, dialogue, communal mourning and working through a difficult past. Exploring a broad range of memorial practices, the book focuses on the ways in which cultural memory is mediated, performed and critically reworked by literature and the arts in the former Yugoslavia. Against the methodological nationalism of works that study Serbian, Croatian, or Bosniak culture as self-contained, this book examines post-Yugoslav literature, film, visual culture, and politicized art practices from a supranational angle. Not solely focusing on traumatic memories, but also exploring how post-Yugoslav cultural practices mobilize memory for a politics of hope, this volume moves beyond the trauma paradigm that still dominates memory studies. In its scope and approach, the book shows the relevance of the cultural memory of Eastern European citizens and the contribution they can offer to the building of Europe’s shared cultural memory and transnational identity. In a business world predominantly oriented toward the future, it has paradoxically become ever more common that companies turn towards their pasts. 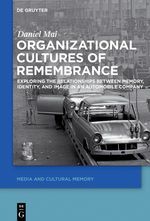 This book empirically explores the phenomenon of organizational remembrance from a holistic cultural perspective. Based on a twelve-month ethnographic case study conducted at the headquarters of the German automobile company, AUDI AG, this study dissects the relationships between memory, identity, and image in a corporate setting. The greater aim in doing so is twofold: First, this study examines exactly why and how a company officially manages its past in terms of ‘history’ and ‘tradition.’ And second, this study scrutinizes what effect organizational remembrance has on the workforce – how it impacts their collective identification with a corporate community and influences their understanding of their daily working life. By investigating the interplay between different stakeholder groups, as well as their practices, media, mental models, and other vehicles of remembrance, an integrated account is offered which makes sense of the complex cultural forces at work in the corporate handling of the past, the present, and the future. This book places transcultural memory in the South Asian cultural and literary context. Divided into two parts, the book first defines transcultural memory in the age of globalised modernity both as a theory and social practice. Then it examines contemporary Indo-English novels from India and Pakistan with the theoretical and methodological tool of transcultural memory to shed new light on the connection between memory and modernity, and memory and South Asian cultures in the wake of new social and political transformations on the Indian subcontinent. A special focus on commemorative tropes in the novels not only show the possibility of a dialogue with different versions of the past, but also how such a dialogue shapes processes of remembrance between and beyond borders. Hence, the books comes up with alternative ways of reading the Indo-English novels, divesting the concept of (trans)cultural memory from its Euro-centrism and claiming it as equally significant in comprehending the new configurations of memory and modernity in non-Western locations. How do memories circulate transnationally and to what effect? How to understand the enduring role of national memories and their simultaneous reconfiguration under globalization? Challenging the methodological nationalism that has until recently dominated the study of memory and heritage, this book charts the rich production of memory across and beyond national borders. Arguing for the fruitfulness of a transnational as distinct from a global approach, it places the issues of circulation, articulation and the scales of remembrance at the centre of its inquiry. In the process, it sheds new light on the ways in which mediation, post-coloniality, migration and regional integration affect both the way we remember and the role of memory in contemporary societies. In this interdisciplinary collection, humanities and social science scholars examine a rich sample of cases from the nineteenth century on, stretching across the globe from Vietnam to Europe and the Middle East, to the USA and the Pacific, and involving a wide range of cultural practices from quilting to films, from photography to heritage sites and monuments. In the process, the volume develops a new theoretical framework while proposing new methodological tools and resources for studying collective remembrance beyond the nation-state. The twenty-seven original contributions to this volume investigate the ways in which the First World War has been commemorated and represented internationally in prose fiction, drama, film, docudrama and comics from the 1960s until the present. The volume thus provides a comprehensive survey of the cultural memory of the war as reflected in various media across national cultures, addressing the complex connections between the cultural post-memory of the war and its mediation. In four sections, the essays investigate (1) the cultural legacy of the Great War (including its mythology and iconography); (2) the implications of different forms and media for representing the war; (3) ‘national’ memories, foregrounding the differences in post-memory representations and interpretations of the Great War, and (4) representations of the Great War within larger temporal or spatial frameworks, focusing specifically on the ideological dimensions of its ‘remembrance’ in historical, socio-political, gender-oriented, and post-colonial contexts. Miniature Monuments: Modeling German History offers a series of essays on small-scale models of bombed out cities. Created between 1946 and the present, these plastic renderings of places provide eerie glimpses of destruction and devastation resulting of the air war. This study thus permits fresh angles on post-war responses to the compounded losses of WW II, and it does so through considering these “miniature monuments‎” (of, among others, Frankfurt, Munich, Schwetzingen, Heilbronn and Hiroshima) in a deep cultural history that interlaces the sixteenth, eighteenth, and twentieth centuries. Three-dimensional renderings in diminutive size have rarely been subjected to rigorous theoretical reflection. Conventionally, models, whether of ruins or intact spaces, have been assumed to be “easily legible”; that is, they have been assumed to be vehicles of the authentic. Yet rubble and other models should be theorized as complex simulacra of abstract realities and catalysts of memories. Miniature Monuments thus tackles a haunting paradox: building ruins. The book elucidates how utterly contingent processes of crumbling and collapse (the English words for the Latin ruina) came to command such great interest in modern Europe that tremendous efforts were taken to uncover, render, and, most of all, recreate ruins. This book aims at building a bridge between the social and political aspects of remembering and the cognitive and discourse processes driving such activities. By analyzing these cognitive and discursive processes, Bietti explores practices of individual and collective remembering in institutional and private settings in relation to periods of political violence in Argentina. This books begins to fill the conceptual gap between cognitive oriented approaches to remembering that draw conclusions about how memory functions in the mind without a detailed discourse analysis of the communicative interaction in which this process unfolds, and the discourse and pragmatic oriented approaches that are mainly interested in analyzing the rhetorical features of conversational remembering, in some cases disregarding that there are underlying cognitive mechanisms that drive the construction of discourses about past experiences. The empirical analysis shows that individual and collective remembering in relation to periods of political violence in Argentina vary in pragmatic ways due to the fact that these accounts of the past were constructed with reference to the communicative situation. Thus, this book also aims at shedding new light on the current practices of commemoration and remembrance related to periods of political violence in Argentina, in public and private settings. This edited collection makes a progressive intervention into the interdisciplinary field of memory studies with a series of essays drawn from diverse theoretical, practitional and cultural backgrounds. The most seminal critical development within memory studies in recent years has arguably been the turn towards transculturalism. This movement engenders a series of methodologies that posit remembrance as a fluid process in which commemorative tropes work to inform the representation of diverse events and traumas beyond national or cultural boundaries, transcending – but not negating – spatial, temporal and ideational differences. Examining a wide range of historical and cultural contexts, the essays in this collection focus on the dialogues that shape processes of remembrance between and beyond borders, critiquing the problems and possibilities inherent in current discourses in memorial practice and theory as they approach the challenge of transculturalism. The concept of Heimat with its seemingly pre- or anti-modern connotations of rootedness in a place of origin is central to a critical understanding of German history and culture. Over the course of the past fifteen years, scholars across a range of disciplines have found new ways to examine the changing notions of Heimat – its multifaceted cultural, literary, and visual history, its gendered connotations, and its national and ideological appropriations.This anthology is the first to examine cultural manifestations of Heimat by giving special consideration to issues of memory and space. The contributions to this volume challenge static notions of place often associated with Heimat. Instead, they explore the social and cultural production of places of belonging as they emerge in literary and visual narratives ranging from 1800 to 2000 and beyond. Although the anthology includes historical perspectives on Heimat, its overall objective is not to trace its cultural or literary history, but to place this complex term into new conceptual contexts. Drawing attention to manifestations of Heimat within German literary and cultural studies provides a rich ground for exploring the transformation of locality in trans/national contexts. Nineteenth-century outlaw Ned Kelly is perhaps Australia’s most famous historical figure. Ever since he went on the run in 1878 his story has been repeated time and again, in every conceivable medium. Although the value of his memory has been hotly contested – and arguably because of this – he remains perhaps the main national icon of Australia. Kelly’s flamboyant crimes turned him into a popular hero for many Australians during his lifetime and far beyond: a symbol of freedom, anti authoritarianism, anti imperialism; a Robin Hood, a Jesse James, a Che Guevara. Others have portrayed him as a villain, a gangster, a terrorist. His latest incarnation has been as WikiLeaks founder and fellow Australian “cyber outlaw” Julian Assange. Despite the huge number of representations of Kelly – from rampant newspaper reporting of the events, to the iconic Sidney Nolan paintings, to a movie starring Mick Jagger, to contemporary urban street art – this is the first work to take this corpus of material itself as a subject of analysis. The fascinating case of this young outlaw provides an important opportunity to further our understanding of the dynamics of cultural memory. The book explains the processes by which the cultural memory of Ned Kelly was made and has developed over time, and how it has related to formations and negotiations of national identity. It breaks new ground in memory studies in the first place by showing that cultural memories are formed and develop through tangles of relations, what Basu terms memory dispositifs. In introducing the concept of the memory dispositif, this volume brings together and develops the work of Foucault, Deleuze, and Agamben on the dispositif, along with relevant concepts from the field of memory studies such as allochronism, colonial aphasia, and multidirectionality, the memory site – especially as developed by Ann Rigney – and Jan Assmann’s figure of memory. Secondly, this work makes important headway in our understanding of the relationships between cultural memory and national identity, at a time when matters of identity appear to be more urgent and fraught than ever. In doing so, it shows that national identities are never purely national but are always sub- and transnational. The Ned Kelly memory dispositif has made complex and conflicting contributions to constructions of national identity. Ever since his outlawry, the identities invested in Kelly and those invested in the Australian nation have, in a two-way dynamic, fused into and strengthened each other, so that Kelly is in many ways a symbol for the national identity. Kelly has come to stand for an anti-establishment, working class, subaltern, Irish-inflected national identity. At the same time he has come to represent and enforce the whiteness, hyper-heterosexual masculinity and violence of “Australianness”. Basu shows that Kelly has therefore always functioned in both radical and conservative ways, often both at once: a turbulent, Janus-faced figure. This study investigates the function of the radio play as medium of cultural memory, based on the memories of the holocaust found in the radio plays of the GDR. In comparison to the presentation of the holocaust in other media, which has already been explored various times, here for the first time the focus is on the specific aesthetic means of the radio play and the role of radio as political instrument of power in the FRG-GDR conflict. Extracts from the analyzed radio plays are included in the enclosed audio CD. The volume gathers twenty original essays by experts of American memory studies from the United States and Europe. It extends discussions of U.S. American cultures of memory, commemorative identity construction, and the politics of remembrance into the topical field of transnational and comparative American studies. In the contexts of the theoretical turns since the 1990s, including prominently the pictorial and the spatial turns, and in the wake of multicultural and international conceptions of American history, the contributions to the collection explore the cultural productivity and political implications of both officially endorsed memories and practices of oppositional remembrance. Reading sites of memory situated in or related to the United States as crossroads of transnational and intercultural remembering and commemoration manifests their possibly controversial function as platforms and agents in the processes of cultural exchange and political negotiation across the spatial, temporal, and ideological trajectories that inform American Studies as Atlantic Studies, Hemispheric Studies, Pacific Studies. The interdisciplinary range of issues and materials engaged includes literary texts, personal accounts, and cultural performances from colonial times through the immediate present, the significance of war monuments and ethnic memorials in Europe, Asia, and the U.S., films about 9/11, public sculptures and the fine arts, American world’s fairs as transnational sites of memory. This collection of essays brings together two major new developments in cultural memory studies: firstly, the shift away from static models of cultural memory, where the emphasis lies on cultural products, in the direction of more dynamic models where the emphasis lies instead on the cultural and social processes involved in the ongoing production of shared views of the past; and secondly, the growing interest in the role of the media, and their role beyond that of mere storage, within these dynamics.The specific concern of this collection is linking the use of media to the larger socio-cultural processes involved in collective memory-making. The focus rests in particular on two aspects of media use: the basic dynamics of “mediation” and “remediation”. The key questions are: What role do media play in the production and circulation of cultural memories? How do mediation, remediation and intermediality shape objects and acts of cultural remembrance? How can new, emergent media redefine or transform what is collectively remembered? The essays of this collection focus on social, historical, religious, and artistic media-memories. The authors analyze the memory-making impact of news media, the mediation and remediation of lieux de mémoire, the medial representation of colonial and postcolonial, of Holocaust and Second World War memories, and finally the problematization of these very processes in artistic media forms, such as novels and movies. It is only through certain forms of social use that media become “Media of collective memory”. The phenomenon of a “Remembrance film”, too (e.g. Das Leben der Anderen, Hotel Ruanda, On connaît la chanson ) only comes about in a plurimedial context with its incorporation into a complex systemic media network that makes it into a remembrance film through various forms of reference. The volume analyses film using the methodology of studies in cultural memory to reveal the functioning of these constellations. This handbook represents the interdisciplinary and international field of “cultural memory studies” for the first time in one volume. Articles by renowned international scholars offer readers a unique overview of the key concepts of cultural memory studies. The handbook not only documents current research in an unprecedented way; it also serves as a forum for bringing together approaches from areas as varied as sociology, political sciences, history, theology, literary studies, media studies, philosophy, psychology, and neurosciences. “Cultural memory studies” – as defined in this handbook – came into being at the beginning of the 20th century, with the works of Maurice Halbwachs on mémoire collective. In the course of the last two decades this area of research has witnessed a veritable boom in various countries and disciplines. As a consequence, the study of the relation of “culture” and “memory” has diversified into a wide range of approaches. This handbook is based on a broad understanding of “cultural memory” as the interplay of present and past in sociocultural contexts. It presents concepts for the study of individual remembering in a social context, group and family memory, national memory, the various media of memory, and finally the host of emerging transnational lieux de mémoire such as 9/11. The first biopics of poets were shown in cinemas in the USA in 1909 and in Germany in 1912. Since these early beginnings, a constant and rich tradition has developed of biopics of figures from literary history. This study is the first to carry out a longitudinal and lateral study of the genre. “Poet films” as they are called not only provide differing notions of authorship, but they also help write a history of literature as narrated in film. A filmography furnishes information on 180 feature films with themes from the history of the West European and US literary canons. This volume is the first to model ‘corporeal memory’ as a concept in cultural studies. The contributors work from different perspectives to analyze the function and semioticity of the body in processes of social memory reflected in works of European literature. The central focus is given by works by Dante, Raabe, Goethe, Keller and Freud. Myths have always been with us. Some are constantly being resurrected, some re-emerge in new forms. Their power of survival is due to their adaptability – they undergo updating which can affect their interpretations, the media for their dissemination or their status in the culture of memory. Myths are forms of memory which seemingly tell old stories and in the process – whether intentionally or not – always produce something new. Using an innovative amalgam of theories of memory, narratology and functional history, this literary and cultural study demonstrates the manifold interactions between memory, identity and narration. The author presents the first account of the fundamentals of a ‘cultural memory narratology’ and draws up a genre typology of the fictions of memory which opens the way to a description of the functions of literary constructions of memory. In this volume, concepts of memory from literary studies are systematically recorded for the first time and presented from an historical, theoretical and methodological aspect. The aim is to locate the discussion in the subject discipline within the transdisciplinary discussion of memory and recollection. The volume presents theoretical frameworks, conceptual explications and concrete research perspectives in the subject area of ‘Media of collective memory.’ Representatives of various disciplines examine the manifestations, social functions, cultural differences and the historical development of the media of memory from the 17th century to the present day.